The Iberostar Grand Hotel Paraiso is a five-star all-inclusive resort that sits directly on Playa Paraíso’s breathtaking beach which is a perfect location to host your destination wedding. It is located in the Riviera Maya, Mexico just 25 minutes far from Playa del Carmen and from Cancún International Airport. Today, it’s the most happening tourist spot with a variety of bars, restaurants, nightclubs, shops and a tons of charm. After a great day at the beach, you can go to the Quinta Avenida or Fifth Avenue which is next on the list of things to do. For the ultimate beach vacation, destination wedding or honeymoon in the Caribbean, Playa is the place to be. 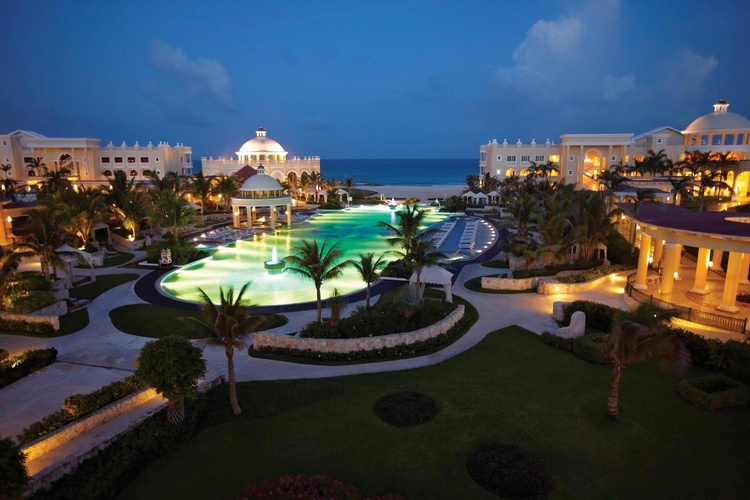 The Iberostar Grand Hotel Paraiso is luxury at its best. This is where adults come to experience a whole new level of luxury in service. 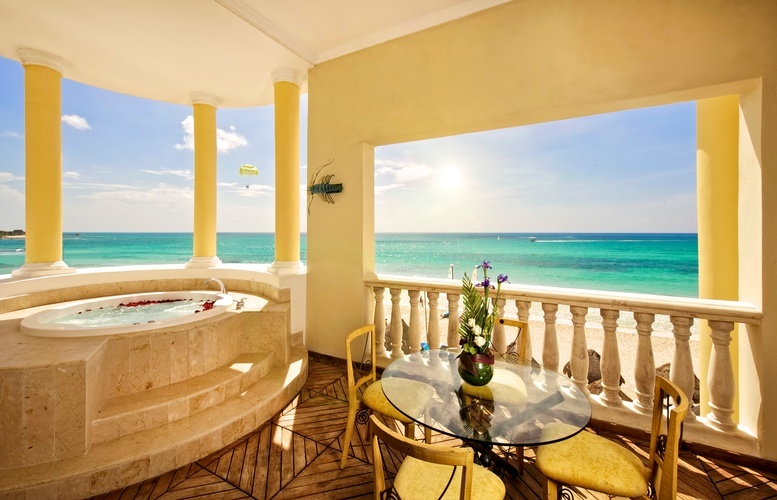 In this five-star all-inclusive resort richness is all around you, from elaborate staircases and an extraordinary garden to exclusive ocean view a la carte restaurants, and concierge, butler service, cigar bar, and more. As part of the Grand collection, this masterpiece is in a class all on its own, complete with “Grand Star Service” with butlers in rooms and by the beach and poolside. The Iberostar Grand Hotel Paraiso even has its very own private spa with steam room, gym and Thalasso pool. Not to mention, an infinity pool filled with salted water. Because at Iberostar Grand Hotel Paraíso, even floating around is an opulent experience. When you’re on vacation, your hotel room becomes your home away from home. That’s why Iberostar takes care of having everything you’re used to like plush pillows, comfortable sheets, a cozy atmosphere, even a balcony or a terrace. From standard suites to ocean view junior suites to ocean front junior and presidential suites, you surely won’t be homesick. Amenities range from indoor or balcony Jacuzzis, a dining and an outside sitting area complete with comfortable couch and even a swing. Plus, of course, the comforts of home like iron/ironing board, a safe deposit box, a mini-bar(soft drinks, wine, national & international beer, juice, and spirits/mixers) a hair dryer, satellite television, DVD player, iPod dock, air conditioning, vanity mirror, and toiletries from London’s Gilchrist & Soames . And don’t forget, room service is available and included 24 hours a day. Satisfy your every gastronomic desire at Iberostar Grand Hotel Paraíso. This opulent five-star all-inclusive resort boasts four a la carte restaurants and one international buffet. Linger on dish after dish of succulent foods, from Japanese cuisine like Teppanyaki to an all-American feast with rib-eye steak and pork chops. And enjoy a fine wine to wash it all down. If you’re not in the mood for a specialty restaurant, enjoy the variety at the buffet. From meats and seafood to salads and desserts, plus everything else you can possibly imagine, it’s all there for you to enjoy one bite at a time. Iberostar Grand Hotel Paraíso has lots of ways to keep you entertained, you’re on vacation after all. From a number of pools and live nightly shows, to bars and nightclubs, and more. Not to mention the secluded beach with sparkling waves and dreamy sunsets. Plus, a cooking class by the water, parties and more. The best part? It’s adults-only. Say ‘I do’to Iberostar Grand Hotel Paraiso. Because of the natural beauty of its surroundings, it’s the perfect place to pledge your love. 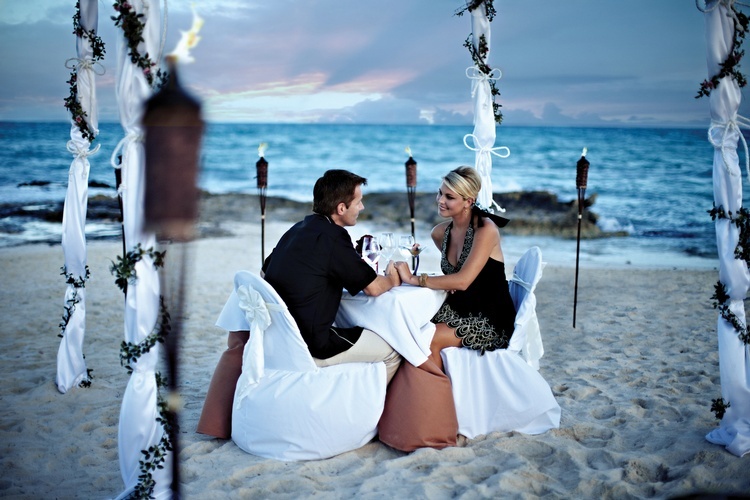 The décor, the beach, the food, all make it the ideal place to get married. A wedding coordinator will take care of everything from the bride’s bouquet and the groom’s boutonnière, to the cake, and even reservations to an a la carte restaurant. Congratulations! WEDDING AND VOWS RENEWAL: Whether you’re getting married or renewing your vows, Iberostar is the perfect backdrop to all that romance. Think ocean views and a beautiful sunset. HONEYMOON: Rekindle your love under moonlit skies and breathtaking sunsets. Not to mention the romantic , candlelit a la carte dinners. BANQUETS: The bridal party and its two stars can enjoy a huge catered feast of appetizers, entrees and let’s not forget desert. Bon appétit. 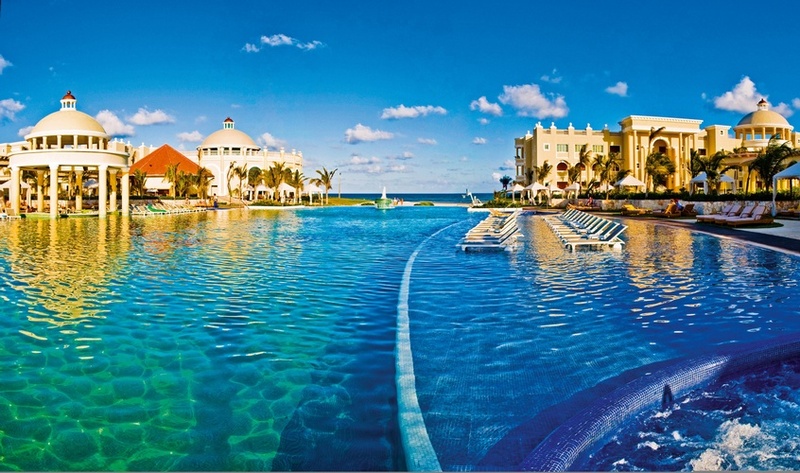 Guest staying at this Iberostar hotel: Star and Silver Star Package $20 USD - Gold Star Package $25 USD. 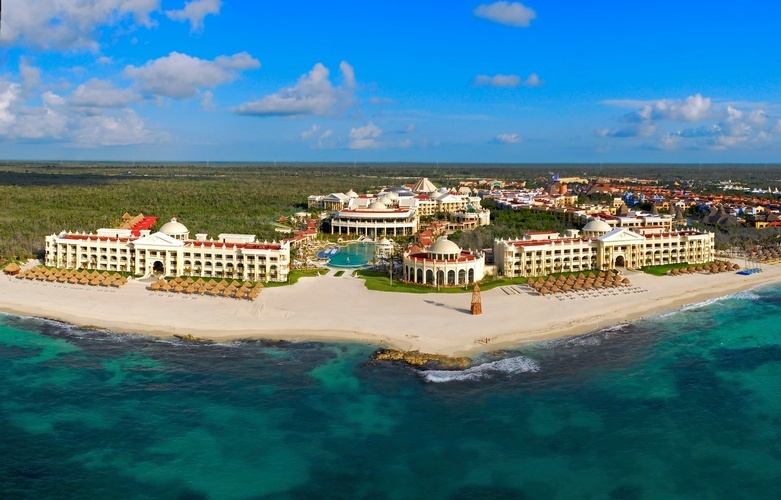 Guest from an Iberostar Premium Gold hotel $40 USD. 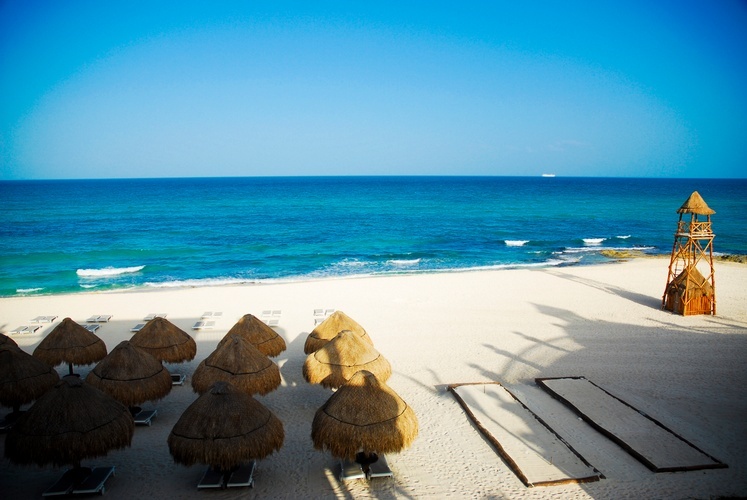 Guest from an Iberostar Premium hotel $75 USD. Non-Iberostar guest $100 USD. * The following are not included in the packages and must be paid for in cash: marriage license ($49 USD) and certificate shipping ($62 USD). ** Musician and flowers availably varies by destination. Note: Wedding couple is included in the number of people each package covers. All packages require that the wedding couple and 80% of the wedding guests stay a minimum of 3 nights at the hotel where the wedding takes place. Other offers may be available. All prices are in US dollars (USD). Non refundable $250 deposit required to lock date for wedding (payment via credit card or wire transfer). Prices are valid for weddings taking place 1/1/18 through 12/31/18. Available for new bookings only. Blackout dates may apply. Restaurant in semi-private area. No substitutions will be allowed. No discounts apply for smaller groups. Prices subject to change without notice. External vendor fees may apply when not using the resort approved suppliers. Wedding couple is included in the number of people each package covers. 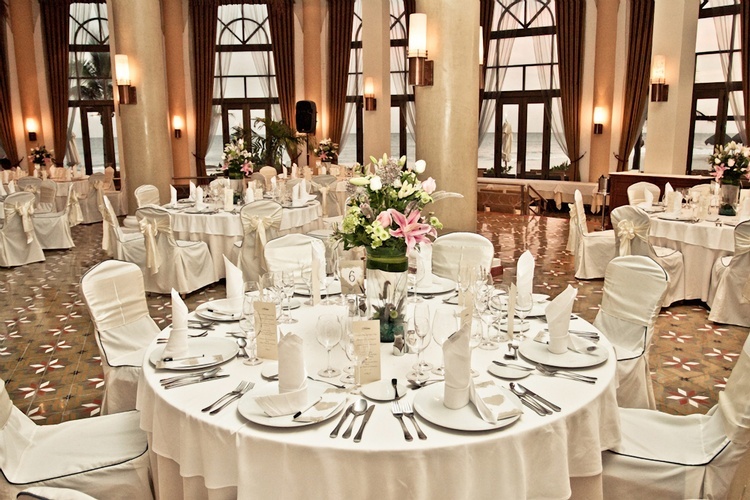 All packages require that the wedding couple and 80% of the wedding guests stay a minimum of 3 nights at the hotel where the wedding takes place. Other offers may be available.All prices are in US dollars (USD). Non refundable $250 deposit required to lock date for wedding (payment via credit card or wire transfer). Prices are valid for weddings taking place 1/1/18 through 12/31/18. Available for new bookings only. Blackout dates may apply. Restaurant in semi-private area. No substitutions will be allowed. No discounts apply for smaller groups. Prices subject to change without notice. External vendor fees may apply when not using the resort approved suppliers. PASSPORTS: Bride and Groom must have valid passports. TOURIST CARDS: Given to every foreigner on the flight into Mexico. BLOOD TEST: To determine blood type, HIV, RH factor and Venereal diseases – by law this must be done in Mexico at the Hotel Medical Center, it costs: US$ 180 per couple (payable just before the test directly to the Medical Center). WITNESSES: You need four witnesses with their picture ID and their Tourist Cards. They need to be here at least four working days prior to the wedding. If you do not bring witnesses, the hotel will provide them without charge. DIVORCE CERTIFICATE: (if required) It is necessary to be divorced at least one year in advance of your Civil Ceremony in Mexico. This is a government law and there are absolutely no exceptions. The divorce certificate must be translated into Spanish. If Bride is divorced Apostille is mandatory. BIRTH CERTIFICATES: translated into Spanish by an official translator with an Apostille attached (An official translator can be found in the yellow pages of your city). Apostille is a form of certification that it is required by the Mexican Authorities in order to make your papers legal in Mexico. If you are European, please contact the Foreign Affairs department in your country. If you are Canadian, please contact the nearest Mexican Embassy or Consulate in order to legalize your Birth Certificate and have it translated. The Mexican Judge usually keeps the birth certificates so we recommend you to bring certified copies rather than originals. The wedding couple and their witnesses must be in Mexico for at least 4 complete business days (Saturdays, Sundays & Public Mexican Holidays are not included) before the wedding, not counting the arrival date or the wedding date, to meet with the wedding coordinator and submit all the required documents and go over the wedding details. The legal ceremony will not be performed unless all documents are in order. Marriage License Apostille (for USA and British Citizens) – After the wedding you will receive your Marriage License. In order to make this valid in your country, we will obtain the Apostille for the Marriage License as well. The procedure takes 3 to 5 months. As soon as we receive it, it will be forwarded to you by courier mailing. Upon receipt, it has to be translated in your country and registered, normally at the city hall. Marriage License original copies are available for $10 USD, payable in cash. This procedure takes approximately one month. Upon receipt, we will mail it by courier mailing. The Bride and Groom as well as the witnesses must have all the required paperwork (Passports, Birth Certificates with the official Spanish translation and the Apostille, Divorce Certificate with the official Spanish translation and the Apostille and the Tourist Cards) for the first meeting. You must check with the Mexican consulate in your country of residence for legal requirements as these can change at any time. 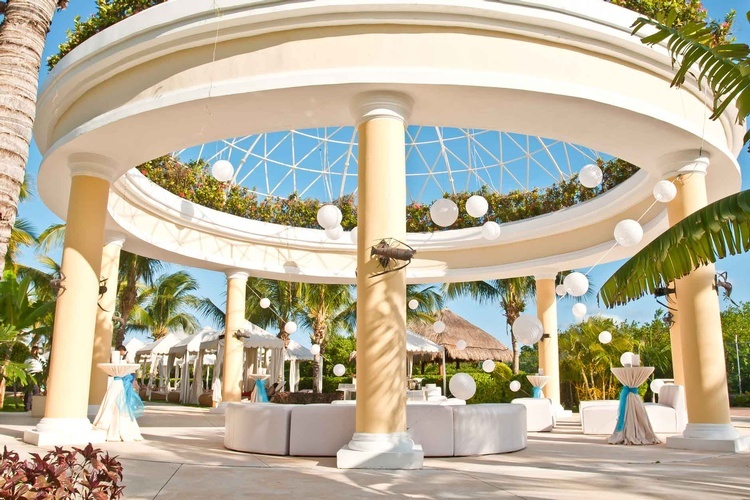 Get Started and Contact MyWeddingAway.com for Best Deals on Riviera Maya Mexico Wedding Packages & Venues!